Living... in San Diego in the 1970's. His bachelor pad is filled with mahogany wood paneling and leather-bound books. But the books are not for reading; they are there to impress his many lady friends. Profession... newscaster. He is a five-time local Emmy award-winning anchor for the KVWN Channel 4 News. One of the secrets to his success is the scotch he drinks before the show. It helps loosen him up. Interests... jazz flute. It has always been a passion. Not to brag, but Ron can make that jazz flute sing. And also play music. Relationship Status... involved with a co-worker named Veronica Corningstone. He couldn't help himself. As he says, "She has beautiful eyes and her hair smells like cinnamon." And it doesn't hurt that her back view is "breath-taking." But love starts turning to hate when she upstages him and is promoted to be his co-anchor. This makes him want to punch her in her ovaries. Challenge... establishing national credibility. He needs to prove he is a serious news anchor worthy of the networks. And his latest story looks like it could be the big one: Ling Wong, the rare panda at the San Diego Zoo, is pregnant. Personality... an egomaniac. From his perspective, why shouldn't he be? He's got gorgeous hair, stylish red suits, and loads of charisma. But as he's about to discover, he's not as god-like as he thinks. 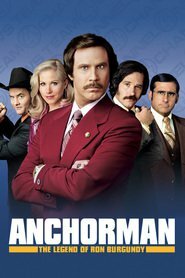 Ron Burgundy's popularity ranking on CharacTour is #300 out of 5,000+ characters. See our top-ranked characters and read their profiles.